Visit us at our new website: www.woostersummerbaseball.org. Registration for the 2018 season is open until Tuesday March 13th, 2018. 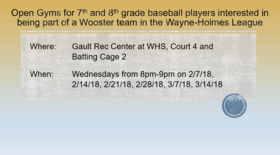 Evaluations will be held that evening at the College of Wooster Scot Center from 7-8pm. You MUST BE REGISTERED prior to evaluations! Teams will be formed shortly after that date, practices begin, and uniforms ordered!